What do you do when your 1,400-pound (approx. 635-kilogram) bear just needs a warm hug? Well, of course you give him cuddles! Most wild animals could never be tamed—but this lovable hunk was one of a kind. Jimbo the huge Kodiak brown bear was born in captivity. He was injured, and Jim Kowalczik knew he could never be returned to the wild when he decided to take him under his wing as a cub. When Jim and Susan Kowalczik founded the Orphaned Wildlife Center in Otisville, upstate New York, in 2015, Jimbo would spend the rest of his life there with them. He kept company with another 11 bears at the sanctuary. They would all be released into the wild once they were healed of their injuries. Some had survived collisions with cars; others had become orphans when their mothers were killed. 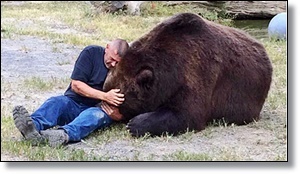 The couple treated Jimbo as part of the family, and Jim was often photographed playing with the affectionate bear, or perhaps the two would just sit relaxed together as friends sometimes do. When Jimbo began to feel out of sorts, last February, a visit from the vet did little to help him, and the cause of his discomfort was unknown, though it was later found to be cancer of the liver.